During and immediately after the Second World War, the United States, the United Kingdom, and other allied nations engaged in a series of negotiations to establish the rules for the postwar international economy. The result was the creation of the International Monetary Fund and the World Bank at the July 1944 Bretton Woods Conference and the signing of the General Agreement on Tariffs and Trade at an international conference in Geneva in October 1947. The lessons drawn by U.S. policymakers from the interwar period informed their approach to the postwar global economy. President Franklin D. Roosevelt and officials such as Secretary of State Cordell Hull were adherents of the Wilsonian belief that free trade promoted not just prosperity, but also peace. The experience of the 1930s certainly suggested as much. The policies adopted by governments to combat the Great Depression—high tariffs, competitive currency devaluations, discriminatory trading blocs—helped destabilize the international environment without improving the economic situation. This experience led leaders throughout the anti-Axis United Nations alliance to conclude that economic cooperation was the only way to achieve both peace and prosperity, at home and abroad. This vision was articulated in the Atlantic Charter, issued by Roosevelt and British Prime Minister Winston Churchill at the conclusion of the August 1941 Atlantic Conference. The Charter’s fourth point committed the United States and the United Kingdom “to further the enjoyment by all States, great or small, victor or vanquished, of access, on equal terms, to the trade and to the raw materials of the world which are needed for their economic prosperity,” while its fifth point expressed their commitment to “the fullest collaboration between all nations in the economic field with the object of securing, for all, improved labor standards, economic advancement and social security.” The two countries elaborated upon these principles in Article VII of their February 1942 agreement on lend-lease aid. In that article, the United Kingdom agreed that in return for U.S. lend-lease assistance, it would cooperate with the United States in devising measures to expand “production, employment, and the exchange and consumption of goods,” to eliminate “all forms of discriminatory treatment in international commerce,” to reduce barriers to trade, and generally to achieve the goals laid out in the Atlantic Charter. By early 1942, U.S. and British officials began preparing proposals that would foster economic stability and prosperity in the postwar world. 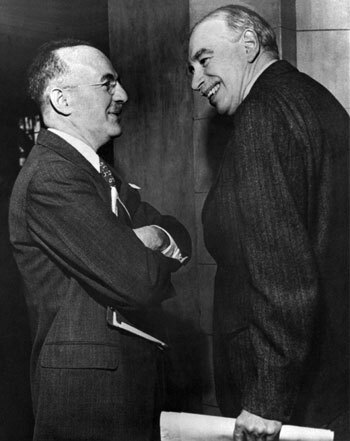 Harry Dexter White, Special Assistant to the U.S. Secretary of the Treasury, and John Maynard Keynes, an advisor to the British Treasury, each drafted plans creating organizations that would provide financial assistance to countries experiencing short-term balance of payments deficits; this assistance was meant to ensure that such countries did not adopt protectionist or predatory economic policies to improve their balance of payments position. While both plans envisioned a world of fixed exchange rates, believed to be more conducive to the expansion of international trade than floating exchange rates, they differed in several significant respects. As a result, from 1942 until 1944, bilateral and multilateral meetings of allied financial experts were held in order to settle upon a common approach. Agreement was finally reached at the July 1944 United Nations Monetary and Financial Conference, a gathering of delegates from 44 nations that met in Bretton Woods, New Hampshire. The two major accomplishments of the Bretton Woods conference were the creation of the International Monetary Fund (IMF) and the International Bank for Reconstruction and Development (IBRD), commonly known as the World Bank. The IMF was charged with overseeing a system of fixed exchange rates centered on the U.S. dollar and gold, serving as a forum for consultation and cooperation and a provider of short-term financial assistance to countries experiencing temporary deficits in their balance of payments. The IBRD was responsible for providing financial assistance for the reconstruction of war-ravaged nations and the economic development of less developed countries. In July 1945, Congress passed the Bretton Woods Agreements Act, authorizing U.S. entry into the IMF and World Bank, and the two organizations officially came into existence five months later. The fixed exchange rate system established at Bretton Woods endured for the better part of three decades; only after the exchange crises of August 1971, when President Richard M. Nixon suspended the dollar’s convertibility into gold, and February/March 1973 did floating exchange rates become the norm for the major industrialized democracies. Agreement on international trade proved more difficult to achieve. One of the most contentious issues was the system of preferential tariffs established among the members of the British Commonwealth in 1932, whereby trade within the Commonwealth was subject to lower tariffs than trade between the Commonwealth nations and the rest of the world. U.S. officials such as Cordell Hull opposed imperial preferences on both ideological and practical grounds—the United Kingdom and Canada, both members of the system, were the United States’ two largest trading partners—and called for their abolition; however, many U.K. and other Commonwealth officials favored keeping the preferences, at least until the United States agreed to reduce the high Smoot-Hawley tariffs set in 1930. After more than four years of negotiations on this and other issues—such as the rules that would govern tariff negotiations and the structure of a proposed new organization to oversee international trade—agreement was finally reached in 1947. Twenty-three nations meeting in Geneva from April to October 1947 concluded the first postwar round of tariff negotiations, leading to reductions in tariffs and imperial preferences, as well as a draft charter for a new institution, the International Trade Organization (ITO). Participants also signed the General Agreement on Tariffs and Trade (GATT), designed not only to implement the agreed tariff cuts but to serve as an interim codification of the rules governing commercial relations among its signatories until the ITO was created. In November 1947, the United Nations Conference on Trade and Employment convened in Havana to consider the draft ITO charter; four months of negotiations later, the representatives of 53 countries signed the finished charter in March 1948. However, strong opposition in the U.S. Congress meant that the ITO never came into existence. Instead, it was the GATT that governed postwar international trade relations for almost fifty years. Under the GATT’s aegis, eight rounds of trade negotiations resulted in significant tariff reductions among its members before it was superseded by the World Trade Organization in 1995.